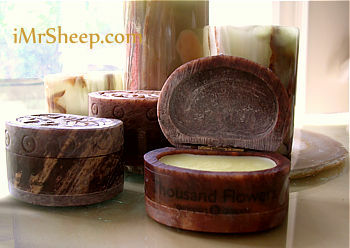 Luxurious Solid Perfume in unique soapstone containers hand-carved and Fairly Traded in India. Ingredients: Organic Coconut Oil, Beewax, Caprylyc/Capric Triglyceride or Almond Oil, Perfume Oil, Vitamin E. Made in Canada. This amazing solid perfume can also be used as a hand butter and for the light hair styling, e.g. to prolong the life of your curls on the ends of your hair. Since hair retains scents longer than skin, this natural fragrance will last longer when applied onto the hair ends. Green Tea: Exquisite citrus and gently spicy green tea. Oasis: Sweet, fruity with tropical mango and coconut notes. Patchouli Rose: Earthy, floral and extremely sensual. Thousand Flowers: Flowery, freshly sweet and sour notes captured in one jar. Vanilla Bean: Warm, sweet, friendly and romantic. White Lotus: Deep floral notes of earth and aromatic woods. GANESHA'S GARDEN SOLID PERFUMES in hand carved soapstone containers. Photography © Irene & Mr. Sheep. 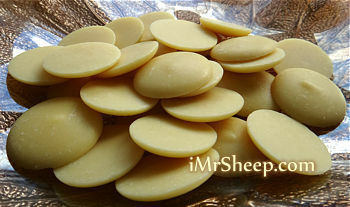 Superior quality, expeller pressed, undeodorized, pure cacao butter wafers for DYI cosmetic products: homemade balms, body butters, and soaps. 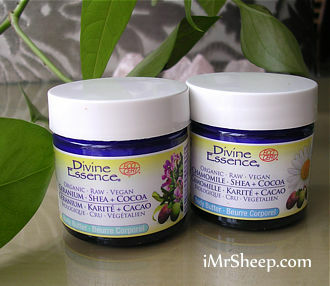 Cacao butter is excellent for nourishing dry and dehydrated skin. It can also be used to protect and revitalize hair. Origin: Peru. Profile: Sweet and delicate aroma with chocolate undertones. Certified Organic by EcoCert. Packed by Irene & Mr. Sheep in flavour-retaining packs. 100 % Natural and *100 % Organic. Superior quality, pure, unscented and deodorized, 100% organic Shea butter. It deeply nourishes and stimulates skin regeneration. Shea butter is an intense moisturizer, it calms and nourishes dry and damaged skin. It also keeps hair healthy by maintaining its natural elasticity. Origin: Ghana. Certified Organic by EcoCert. Packed by Irene & Mr. Sheep in Blue glass food grade PET bottles, guaranteed BPA-free (bisphwnol-A free). Please refrigerate after opening. 100 % Natural and *100 % Organic. 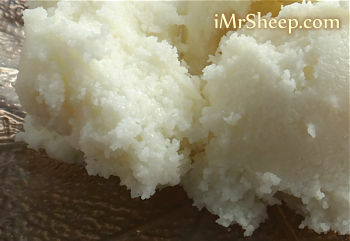 Pure and unrefined Organic Raw Shea butter. It contains vitamins A, E, F, revitalizes body, helps heal scratches and irritated skin, reduces fine lines, wrinkles, stretch marks, scars. Ingredients: Organic Unrefined Butyrospermum Parkii. ORGANIC COSMETICS: Hand Butters, Moisturizers, Floral Water. Made in Canada. PRETTY® Organic Cosmetics is free of synthetic fillers, chemicals, and preservatives: No parabens, no mineral oils, no silicones, no propylene glycol, no ethanolamines, no sulphates, no petrochemicals, no synthetic fragrance. No preservatives. Vegan. No animal testing. Floral waters are classically steam-distilled and contains the nutrients and essences of flowers used: Roman Chamomile - soother sensitive or irritated skin, Rose - an exquisite skin tonic, Lavender - revitalizes and soothes dry skin. True Lavender Facial Tonic, Roman Camomile Floral Essence. Ingredients, Nourishing Rose Hand Butter - Organic shea butter, Organic Virgin Coconut oil, Sweet Almond oil, Olive oil, Organic Jojoba oil, Neem oil, Essential oils: Magnolia, Organic Rose Geranium, Organic Palmarosa, Organic Lavender, and Rosemary. Ingredients, Luscious Lavender Hand Butter - Organic shea butter, Organic virgin coconut oil, Sweet almond oil, Olive oil, Organic jojoba oil, Neem oil, Organic lavender essential oil, Essential rosemary oil. Ingredients, Crème de Cacao Intensive Night Repair - Raw cacao, Meadowfoam oil, Organic Virgin Coconut oil, Organic Jojoba oil, Evening Primrose oil, Grapeseed oil, Sweet almond oil, Beeswax, Lecithin, Vegetable glycerin, Vitamin E, Rosemary essential oil. Ingredients, Triple Rose Facial Tonic - Organic Rose Damascena water distillate. Ingredients, True Lavender Facial Tonic - Organic True Lavender water distillate. Photography © Irene & Mr. Sheep Co.
Eco-Cert Greenlife certified. Made in Canada. Free of Petrolatum, Silicon, Artificial Fragrances, PEGs, Dyes, Parabens. 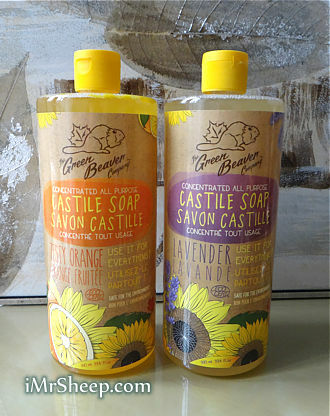 100% of the total ingredients are from Natural origin, 53% (castile soaps - 83.3%) are from Organic farming. Made with cold-pressed locally harvested organic sunflower seed oil. Reach in vitamin E and skin moisturizing omegas. Ideal for sensitive skin. Safe for your skin and environment, this concentrated all-purpose liquid sunflower soap can be used as a body wash, in handsoap dispenser, as a dish soap, floor cleaner, as a laundry detergent and wool wash, and as an ingredient in a tile/tub/stovetop scrub. Please find How To Use Instructions printed on the label. 100% of the Ingredients are from Natural origin, 31.7% - from Organic farming. Certified by EcoCert Green Life. Ingredients, Lemongrass Soap: Palm Oil & Coconut Oil, Water, Alkali (NaOH), Lemongrass Fragrant Oil, Yellow Clay French, Sandalwood Powder Made in Indonesia. Superbly moisturizing and pleasant to all types of skin, including sensitive. 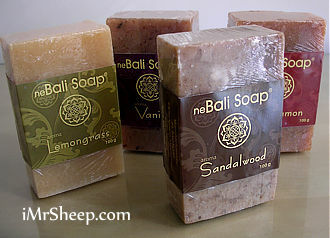 The basic ingredients in Bali Soaps are natural palm kernel and coconut oils. Palm oil is used in household from the ancient times, and it is a common ingredient in shampoos, conditioners, soaps, lotions, creams, and other beauty products. The main benefit of the palm kernel oil is the content of toctrienols - a form of vitamin E, tocopherol. Palm oil in soaps does a miracle - it helps to remove oil and dirt from the skin, deeply moisturizing it at the same time. Vitamin E helps to fight fine lines, vitamin K strengthens the skin. Cholesterol-free. * The palm oil is extracted from fresh palm (Elaeis Guineensis) fruits. The kernels (nuts) in the center of the fruits are crushed to extract the palm kernel oil.